Today was a day of performances. The first performance was mine – as The Composed Teacher – when I discovered two of my students, mid-skirmish, one wielding a wooden sword. The next came at our inter-house lip sync competition. My house representatives (Cargill) were to mime “A Whole New World” (Aladdin). Sadly, Princess Jasmine got the jitters, and so an unrehearsed substitute was cued to costume-up and improvise opposite our turban-wearing male lead. I was then called upon for an encore of The Composed Teacher when the projector’s data cable failed to work, and so my techie lad’s backdrop movie (a moving landscape in the background, in true ’40s special effect style) failed to display initially behind the two stars (kneeling on a rug atop tables, complete with a well-drawn monkey beside them). Once this was overcome, the highlight of the entire show was when paper birds on sticks, with flapping wings, “flew” by the stationary carpet. Alas, after all of the time spent at our single rehearsal, we came second (but boy did we throw a good show!). 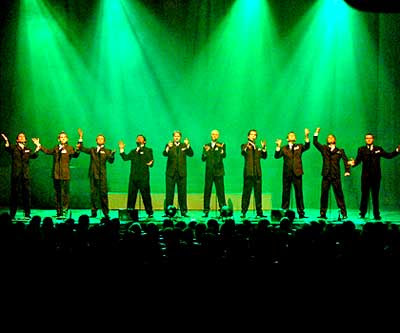 The final act of the day, The Ten Tenors, took place at Dunedin’s The Regent Theatre. This troupe’s offerings have been described as “opera, without the boring bits”, with some contemporary music thrown in. I found “Bohemian Rhapsody” to be the highlight, closely followed by their Italian pieces. Stephanie, a colleague from school, treated me to the show, and I am pretty sure I was the youngest person there. There’s a vid of The Ten Tenors performing “Bohemian Rhapsody” on YouTube, but different soloists featured tonight (whom I preferred). Erika, one of my dear sisters, is only 2½ years my junior. One evening I asked her to meet me at a Filipino restaurant, where I was dining with friends (Tray, Flo and Di). She came upstairs to find us flinging our arms about to the karaoke backing track for “Bohemian Rhapsody” (none of us in need of the words and animated bouncing ball). She looked completely puzzled, and sat down to wait out the song, head tipped sideways. Once it was over, she directed her question to me, “What…was that? I have never heard that song….ever.” We were shocked, to say the least. Apparently 2½ years is enough to form a generation gap; for one sister to have lived and breathed Queen during their revival years, and the other to have simply missed it (please note that between my flatmates we had gone to three different high schools, but all knew this song. Erika however, did not.) INtriguing. Tell me, were others on the “Queen’s back” bandwagon, around ’93-94?